Raleigh, NC, March 29, 2019 — This week WISER Systems, Inc. will return to Industry Week’s Manufacturing & Technology (M&T) conference to showcase its ultra-wideband (UWB) tracking and location system live. WISER’s demonstration will highlight how real-time asset visibility reduces costs and bolsters operations in heavy industry settings. WISER has designed its tracking system for harsh and complex settings. While most RTLS technologies fail to perform reliably around reflective surfaces or metal, WISER delivers submeter precision in its manufacturing and heavy industry applications—often registering accuracy within just a few inches. Manufacturing applications of WISER’s system include process management, such as tracking work orders or batching procedures, tracking individual parts, virtual zoning, and asset location—often paired with passive systems like barcodes. WISER first presented at M&T in 2018. Designed for manufacturing professionals and managers of all types, M&T 2019 combines a variety of workshops, breakout sessions, exhibitions, and presentations organized to give manufacturers an edge via the latest innovations in relevant technologies. This year’s conference tracks include supply chain, factory automation, smart manufacturing, and advanced continuous improvement, among other topics. Attendees are also invited to tour several modern factories near the event venue to see best practices and new technologies at work. The M&T conference will take place at the David L. Lawrence Convention Center in Pittsburgh, PA from April 1 to 3. Visit WISER representatives at booth 613. WISER Systems will join just eleven other companies in competition for the Phase IV and final round award in the U.S. Army’s inaugural xTechSearch initiative. WISER Systems, Inc. will conduct live demonstrations of its new real-time 3D asset tracking capabilities and an enhanced mobile user interface at CES 2019. Raleigh, NC, December 17, 2018 — WISER Systems, Inc., a developer of innovative ultra-wideband wireless mesh location and asset tracking systems, announced that the company will unveil several new technology enhancements next month at CES 2019. WISER’s ultra-wideband (UWB) mesh locator solution delivers real-time asset visibility by displaying asset locations and movement histories on a facility map or floorplan, delivering precise identification, location, and tracking in real time without the need for expensive or permanent infrastructure, even in the most complex environments. One of the world’s largest technology events, CES 2019 will host some 165K attendees from nearly every country in the world at a conference organized into 300 distinct sessions spanning more than 50 acres. Approximately 4000 companies will showcase innovative technologies in blockchain, augmented and virtual reality (AR/VR) systems, autonomous vehicles, smart home applications, wireless technologies, gaming, and IoT solutions. Wiser was one of just 1,200 companies selected from a global pool of applicants for the 2019 Eureka Park CES exhibition, where the focus is on new, innovative, and cutting-edge technologies. CES 2019 will take place January 8 - 11 in Las Vegas, NV. WISER Systems will exhibit in Booth #51847 as part of the North Carolina Startup Pavilion. 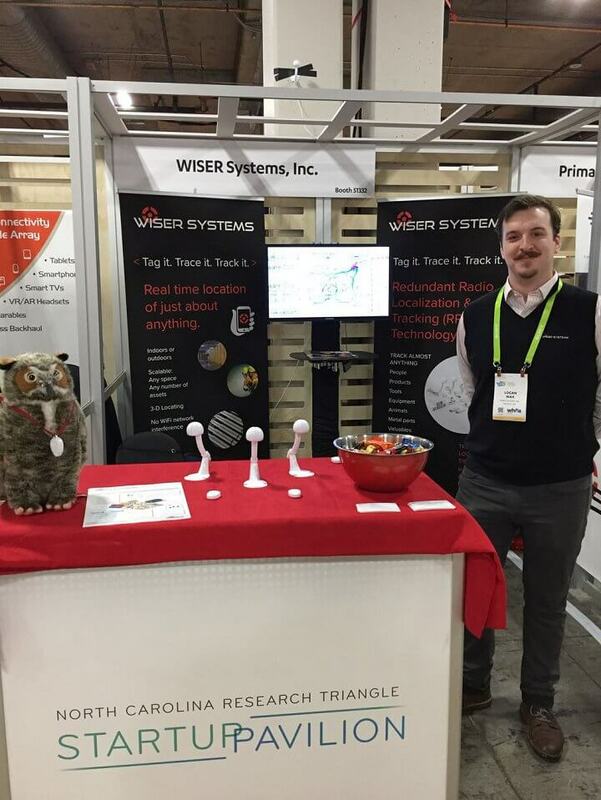 To schedule an editor appointment at WISER’s booth during CES, please contact: Stephen Taylor, WISER Systems, Inc.; stephen.taylor@wisersystems.com, or online at: https://www.wisersystems.com/schedule. Wiser Systems’ innovative ultra-wideband (UWB) mesh network asset location systems employ Redundant Radio Localization & Tracking (RRLT) technology to deliver precision (sub-meter or inch-level) coordinate-based positioning data within a defined perimeter in real time to a computer or handheld device. WISER’s RRLT mesh network is accurate even in cluttered, metallic, noisy, or active manufacturing environments where conventional tracking technologies perform poorly. The systems auto-calibrate, are lightweight, portable, and can be deployed in minutes, indoors or out, without the need for an engineer or electrician. WISER’s locator applications include: autonomous inventory, real-time security, process management, autonomous navigation, smart homes, sports technology, sensor locating, and more. WISER Systems’ products are manufactured in the USA.